This show-stopping cake is easy to prepare and makes a spectacular centrepiece on the festive table. 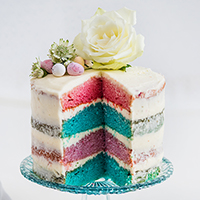 The recipe contains only egg whites which results in a mostly white sponge which can be coloured with gel or paste food colouring to create a beautiful surprise when you slice into the cake. Decorate with mini eggs, sugared almonds and fresh flowers or whatever else takes your fancy. I have flavoured the cake with coconut and vanilla but you can vary the extracts and even frosting to suit your taste. Make sure all ingredients, apart from the butter which should not be too soft, are at room temperature. To ensure even layers, weigh the mixing bowl before you embark on the recipe and then weigh again once you have prepared your batter to be able to divide it equally. If you are using food colouring, gel or paste colours are preferable. 1. Preheat the oven to 180C. Grease 3 x15cm/6in cake tins (or 3x20cm/8in tins) and line with baking parchment. Dust with flour, shaking out any excess. Put the (empty) bowl of your stand mixer on the scales and make a note of the weight. Put the flour, cornflour, sugar, desiccated coconut, baking powder and salt in the bowl of your stand mixer and briefly whisk together on low speed to combine. 2. Add the cubed butter and mix on low speed until the mixture resembles coarse sand. In a measuring jug, mix together the milk, egg whites, coconut and vanilla extracts. Add the egg white mixture into the batter, in three stages, mixing well on low speed after each addition. Increase the speed and mix batter for a minute until batter is smooth. 3. Weigh your (full) mixing bowl again and subtract the weight of the empty bowl. Divide the weight of the batter into 3 or 4 depending on how many cake tins you are using. Pour equal amounts of batter into 3 (or 4) separate bowls and add food colouring. It is best to start with a very small amount of food colouring on the tip of a skewer, mix well, and then increase the quantity of food colouring gradually to intensify the colour. 4. Pour the batter into the prepared tins and bake for 20-25 minutes or until the cakes are well risen, firm on top and coming away from the sides of the tin. A skewer inserted in the centre should come out clean. Cool in the tins for 10 minutes and then carefully turn out on a wire rack lined with baking paper. Cool completely before frosting. 5. To make the frosting, put the mascarpone, icing sugar, double cream and vanilla extract in the bowl of your stand mixer. Start mixing on low speed to combine, then increase the speed to highest setting until you have firm peaks. Do not over-mix.Transfer the frosting into a large piping bag fitted with a plain round tip and pipe the frosting on your bottom cake layer. Outline the edge of the sponge first and then continue filling the interior in an even layer. 6. Repeat with the remaining layers. Smooth the frosting over the entire cake with a palette knife or pastry scraper and chill for 20 minutes. Add a final layer of frosting over the cake, smoothing so that the layers are still visible for a ‘naked cake’ effect. Alternatively you can cover the cake completely and pipe any excess frosting on top. 7. Decorate with mini eggs, fresh flowers, pastel sprinkles or decorations of your choice. Best consumed within a couple of days.